ST. PETERSBURG, Russia — Belgium's golden generation has come up short at a major tournament. Again. With Kevin De Bruyne and Eden Hazard in fantastic form creating chances for themselves and Romelu Lukaku up front, Vincent Kompany fit again at the heart of the defence and Thibaut Courtois standing tall in goal, these Red Devils racked up more goals than any other team in the World Cup. Through five matches, it looked as if they could finally deliver on their promise. "Damn set piece, that's all I can say," Kompany said. 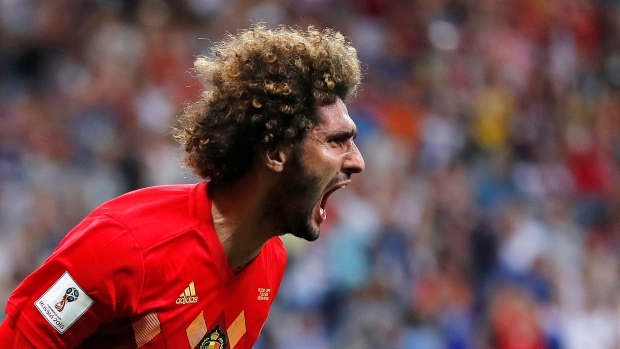 A Belgium team featuring many of the same stars lost 1-0 to Argentina in the World Cup quarterfinal four years ago and then was shocked 3-1 by Wales in the European Championship quarterfinals two years ago. "We had more chances today, we had more control of the match," Kompany said. "We weren't in control two years ago against Argentina." But the potent Belgian attack gradually faded as France's rock-solid defence handed Belgium its first shutout of the tournament. Belgium's beaten players did not want to talk about the end of an era — not with stars like 27-year-old De Bruyne, 26-year-old Courtois and 25-year-old Lukaku in the team and more coming through the youth ranks. "Generations. Who talks about generations?" De Bruyne said. "We are a small country. We can be very happy and lucky that we can have the team what we have. We don't have the resources, the infrastructure, the money that other countries have. What we have is a really good team that performed really well." The last time a Belgium team got this far at the World Cup, it lost 2-0 to Argentina at the 1986 tournament in Mexico. A pair of Diego Maradona second-half goals sank Belgium that day. Long considered the a lesser footballing nation than its neighbour the Netherlands — whose orange-clad teams have reached three World Cup finals and lost them all — this Belgium team has at least dispelled the Dutch shadow. Kompany, an injury-prone 32-year-old who may well have played his last World Cup in Russia, believes that, despite the loss, the class of 2018 has done his nation a favour. "Generations come and go," Kompany said. "For Belgian football I think eventually there will still be an opportunity to do well. It allows the country to be more ambitious and believe in its own talent. So maybe for the future we've still done something good for Belgian football." "As it happens in any big tournament, you need to look at the younger generations and try to become stronger," he said. "From tournament to tournament, that's the drive and the ambition."